3101 FUE Grafts. NWIII vertex with temporal peaks. Early regrowth at 5 months. ICC 2225/2018. 451 FUE Grafts. Eyebrows restoration. Injertocapilar.com.451/2018. 6104 FUE Grafts. MPB NWV. 2 step strategy. Early regrowth at 5 m. in both surgeries. ICC.2150/2018. 3802 FUE Grafts. MPB NW IIIVertex. Restoration and refinement. Injertocapilar.com.1816/2016. 351 FUE Grafts. Female LW I. Injertocapilar.com.1921/2017. 6502 FUE Grafts. MPB NW IV in 2 steps. Injertocapilar.com.1848/2016. 1301 FUE Grafts. Frontal Hair line repair. 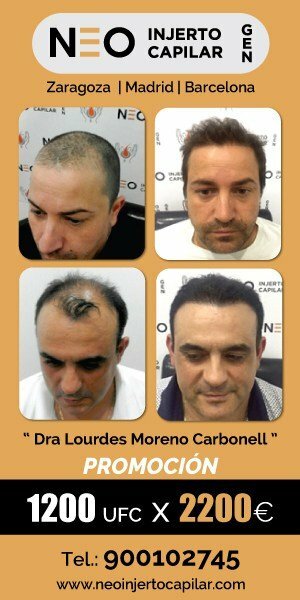 Scar repair after FUT and FUE. ICC1907/2017. 4201 FUE Grafts. MBP NW IV in one step. Injertocapilar.com.2162/2018. 351 FUE Grafts. Cicatrizal alopecia due to Trichotillomania. Injertocapilar.com.1877/2017. Good improvement to medical treatment in a young patient with aggresive DUPA. ICC /2018. 1301 FUE Grafts. Hidden DUPA. Early regrowth at 5 months. Injertocapilar.com.2252/2018. 4303 FUE Grafts. Repair case. Depletion of the donor area. Injertocapilar.com.1864/2017. 8405 FUE Grafts (902 BHT beard) in an MPB NW VII. 3 procedures/4 step strategy ICC 1719/2016. 6002 FUE Grafts. 2 step strategy in a MPB NW V. Injertocapilar.com.1868/2017. 6504 FUE Grafts. BUPA NW V. No shedding. Early regrowth. Shaved. Injertocapilar.com.1863/2017. 2901 FUE Grafts. DUPA-Chronic Atopic Dermatitis. Regrowth at 5 months. ICC.2224/2018. 1671 FUE Grafts. Hidden DUPA Early regrowth 5 months. Injertocapilar.com.2203/2018. 2301 FUE Grafts. MPB NW III with temporal peaks. Early regrowth. Injertocapilar.com.2201/2018.